Are you thinking of buying your first home in Colorado? Would you like detailed information on all of the programs available to help you purchase that first home? If so, read on. The state of Colorado offers many programs for its residents who are first time home buyers and need help with the down payment and closing costs. Additionally, there are still Federal programs available as well as grants from private foundations. In some instances this is free money that shouldn’t be passed up! The grant awards can be in the thousands of dollars. It will be well worth your time to educate yourself about the programs that are available to you as a resident of Colorado. The Colorado Housing Housing and Finance Authority has a Downpayment Assistance Program in the form of a tax credit for eligible home buyers who meet specific moderate income limits to help with down payment and/or closing costs. Check and see what is available and if you qualify. CHFA’s entire organization is focused on helping people and businesses succeed. They’ve seen the positive effects of homeownership and business expansion reverberate throughout communities. One success leads to another, as families become financially stable and companies add more jobs. For CHFA, every happy ending is really a new beginning. Save money every year with the CHFA tax credit program, the CHFA Mortgage Credit Certificate (CHFA MCC)! 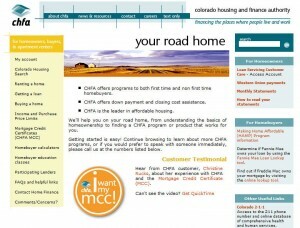 Getting a CHFA MCC is like getting up to a 50 percent discount off your mortgage interest rate. In addition to the grant programs described above, the U.S. Department of Housing and Urban Development provides home buyer assistance and grants in every state. There are multiple grant programs designed specifically for people that meet certain requirements, such as grants for people with disabilities so they can continue to live independently at home. It is worth visiting HUD’s website to see what assistance is currently available. For your convenience, simply go to grants in Colorado. “Arapahoe County has teamed with Colorado Housing Assistance Corporation (CHAC) to provide a program to assist low and moderate income families (and individuals) in the purchase of a home in Arapahoe County. What does the program pay for? “Aurora’s Home Ownership Assistance Program (HOAP) offers a variety of housing-related counseling services as well as educational seminars and financial assistance to help qualified, first-time homebuyers. Other programs include: commercial and home rehabilitation, emergency repair, handicap accessibility, and various public facilities projects. Loans are up to $15,000. Assistance is in the form of a loan with 0% interest deferred due upon sale or transfer of property title. Property must be in Denver County. “Eligible borrowers will receive a deferred forgivable loan with a maximum amount of $5,000, only if needed. These funds can be applied toward the payment of usual and customary closing costs and/or matching up to 50% of the required down payment (this may vary depending on the type of mortgage you select). The borrower must occupy the home as their principal place of residence. Renting the property is not allowed. “Any home located within Summit County; new construction or existing. Present average price for a home in Summit County is over $417,000. Loan amount is based on borrower’s need and availability of down payment assistance. This entry was posted in Down Payment Assistance, First Time Home Buyer Grants, First Time Home Buyer Info, First Time Home Buyer Programs and tagged Affordable Homeownership Program, Assistance Down Payment Program, BAHOP. Bookmark the permalink.